Roses Before Violets: Chickens and Sheep and Kids, Oh My! Whew! We had a busy weekend. Thankfully, soccer was rescheduled to Friday, but then eventually rained out, so that was one place we didn't have to be. I love to watch Caro play soccer, but it was nice to have a break this weekend. 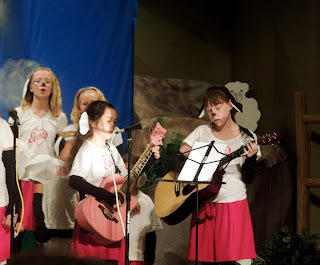 The girls have been practicing for months for a Children's Musical called "We Like Sheep" at church. It was about The Good Shepherd parable. This was the big weekend for the performance. They had dress rehearsal Saturday morning and then performed the play Sunday morning and evening. It was wonderful! I was so proud of them. Addie had one of the main speaking parts, a vocal solo, and she played guitar during one of the songs. 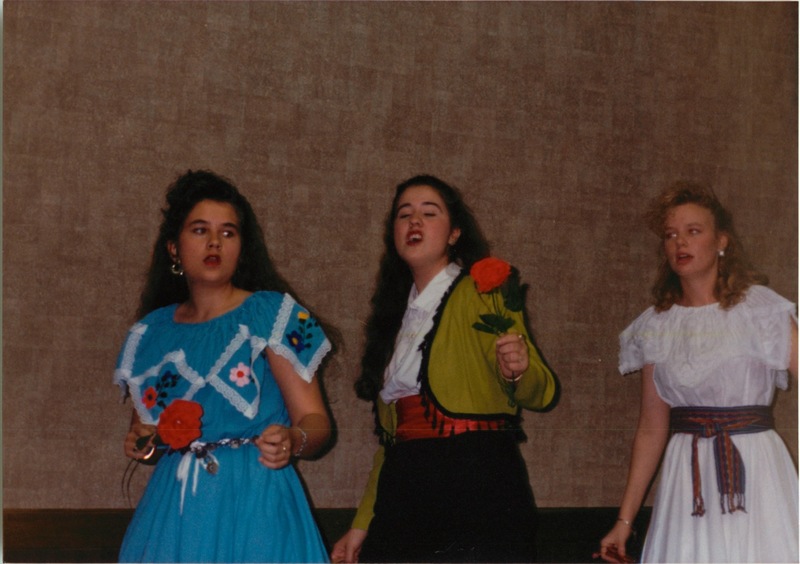 Caroline was a supporting cast member with a small vocal solo. Here are a few pictures. When I was a kid, I despised doing anything in front of people. Who am I kidding? I still despise it. 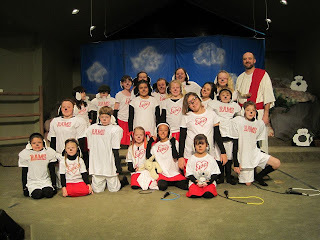 I remember one Christmas play at church where I was supposed to hold up a letter and say a part. I was so nervous, I never even made it on to the stage. I think my Mom just had to hold the letter out from behind the curtain. At my high school graduation, I had to give a Salutatorian speech and I was so scared, that I cried through the entire thing. Then in college, I put off speech class as long as I could. When I finally had to take it, I got stuck with a theater teacher for a professor. She had us walking on tables, putting on hats and "becoming the character" and a bunch of other crazy, embarrassing exercises. I was never so glad for a class to be over. All of this is one of the main reasons I was so proud that they both participated in this musical. I think Addie surprised everyone with her voice. I got SO many comments and compliments from people about how beautiful she can sing. Okay, okay, okay, maybe she does take after me a little bit. Not the voice! The nervousness. In all the practices I saw, as soon as she started her solo, she would commence into an awful coughing fit. I knew it was just nerves (kinda like the crying thing I do when I'm nervous in front of people). So I may or may not have bribed her with 5 bucks if she would get up there and belt that song out without coughing. And Caroline was so funny. She definitely has rhythm. She was moving and swaying throughout all of the songs. 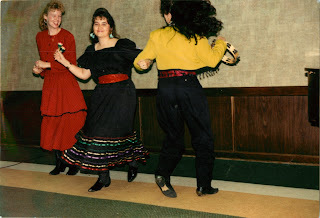 Dancing was not particularly part of the play, but I think it worked. Now if I'm part of a group, it doesn't bother me as bad. I love singing with other people, just not by myself. Maybe if my Mom had bribed me more...... 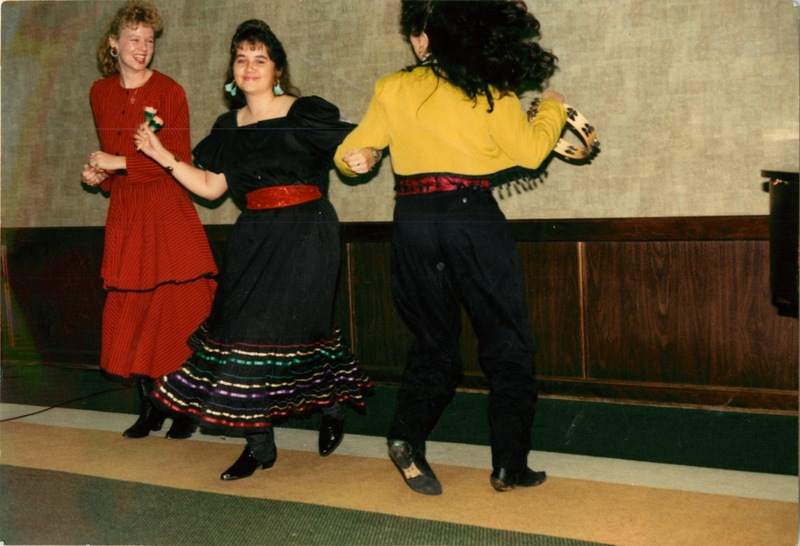 Here are some blasts from the past when my two friends and I competed in Spanish competitions in High School. We harmonized in Spanish to "Besame Mucho" and "Guantanamera". Fun times! I still have this black dress. Can't seem to part with it. My parents, sister, and brother-in-law drove over for the musical and Mike cooked lunch afterwards. Woo hoo! Everyone loves when he cooks. He came up with this "Confetti Chicken" recipe years ago. He's one of those cooks who just throws things together and it comes out great. He also grilled yellow squash and I roasted asparagus with olive oil, salt, and pepper. It was a very colorful and delicious meal. Season chicken breasts with salt and pepper and grill. Chop a green, red, and yellow pepper into small pieces. Saute in a non-stick pan for about 10 minutes. Then add about 1/3 cup of honey and cook for 5 more minutes. Top the chicken breasts with the pepper and honey mixture and serve.